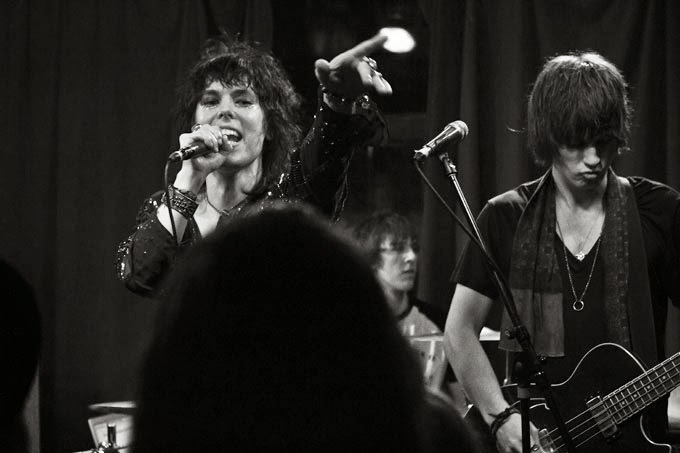 The Struts, I have heard lots of good stories about their live shows but always missed out on their gigs until last week. On Tuesday Morning, they posted on facebook about their The Kiss EP Launch Party taking place in The Monarch that night. This just sounded perfect to me as I live in Camden and planned to go for a drink with friends anyway. So I forced my friends to go to the gig and it was definitely the right choice. The gig was awesome. Especially the appearance of the band. 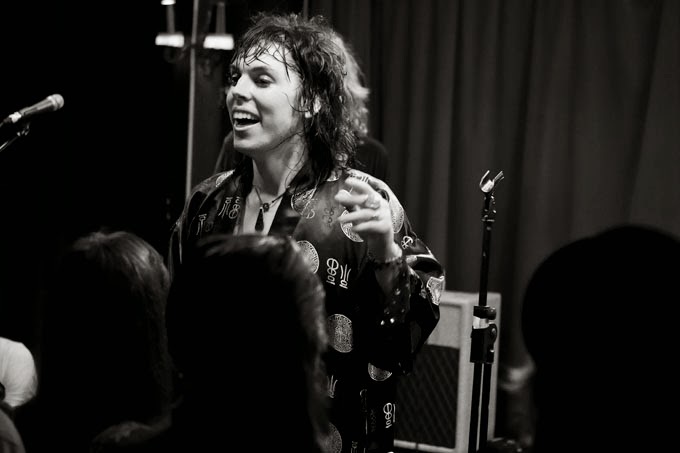 In Luke Spiller, The Struts are blessed with a frontman who, in his own words states 'I was born to do this. And I'll die doing it." 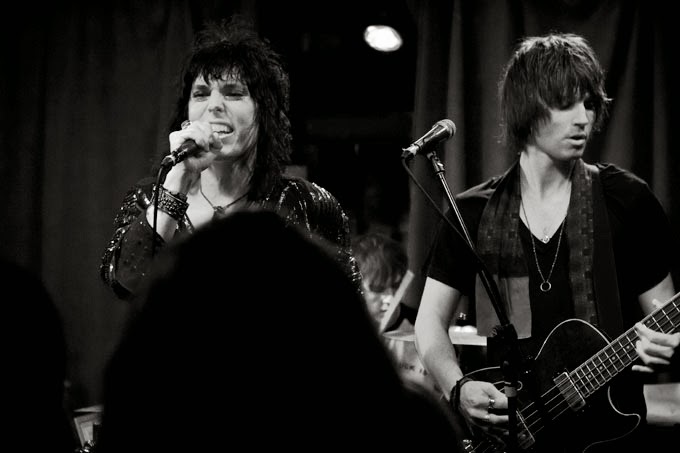 The Struts are a four piece rock & roll band, formed in Derby. Luke Spiller and Adam Slack met in 2009 and after a year writing songs together, Jed Elliott and Gethin Davies joined the band. Quotes like "We'll be fine handling fame. We're already massive rock stars in our heads. Only our circumstances will change and we can afford to go out more often." show that they wanna become big and fill stadiums with their already big fan base. Despite of their really good songwriting skills, they also convince their fans with a unique style and epic live performances. They're playlist consists of their own songs and also rock covers of chart songs. 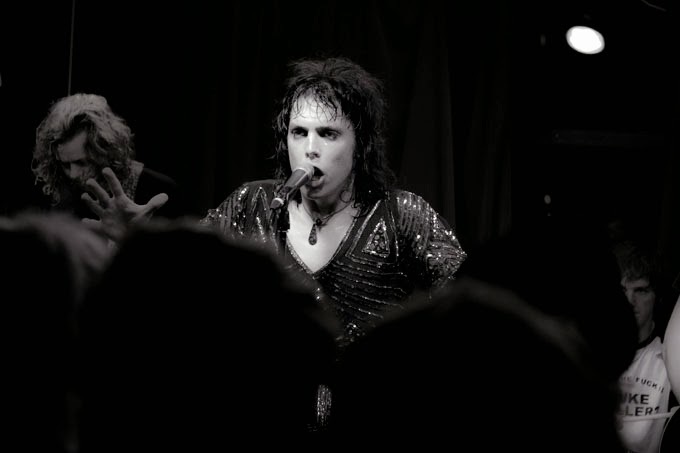 The Struts are definitely a band to keep your eyes on! We came quite late, so the band has already started their set when we arrived. Although it was Tuesday the pub was packed. People were everywhere even on the tables and stairs to get a better view. Luke Spiller was totally in his element playing with the crowd and posing for photographers. He wore a glittery top what reflected in the light and made him even more "shine". You could see that the band really enjoys the gig. When they started to play their new EP everyone was freaking out and everyone was singing along and the groupies screaming in the front row. They played a quite long set and it seemed like everyone enjoyed it. Once they left the stage the crowd filled the pub with shouts of encore. After just a few minutes the band appeared again on stage. Luke used the time to change his outfit to a Asian styled kimono. They played a few more songs and then disappeared for good leaving really good impression. You should definitely try to make it to one of their gigs. It is quite an experience. It doesn't happen that often, that a band has a really good live performance.